Adjustable Shelving Systems by E-Z Shelving Systems, Inc.
E-Z Shelving manufactures the most efficient adjustable shelving systems available. E-Z’s shelving tiers are “infinitely” adjustable along the continuous slot of the E-Z upright, helping you make use of even the most difficult spaces. Adjust one shelf, or the entire tier, to the precise height required for your application. Precision – Adjustments to the fraction of an inch are no problem. 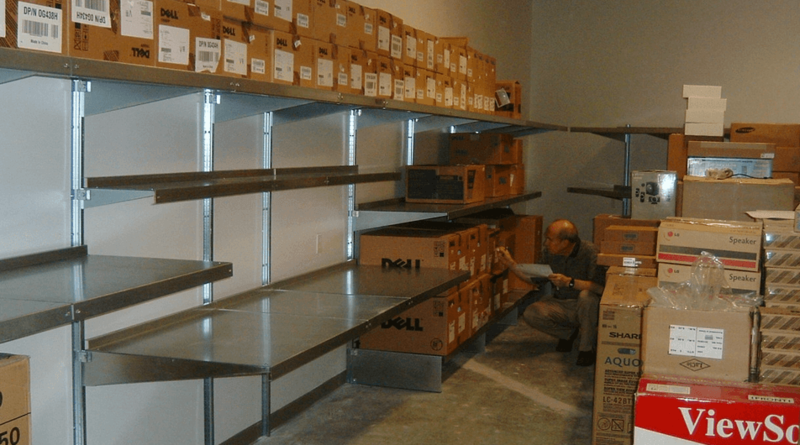 Slide and secure our shelving tiers to the exact level required. Versatility – As your needs change, so can the height of your work surfaces. Change the function of a room by re-configuring your E-Z Shelving components. Scalability – Install E-Z’s shelving uprights to any height practical, floor-to-ceiling. Easily add additional shelving tiers without tearing down. Expanded Possibilities – The versatility of the E-Z shelving system has inspired some non-traditional, but effective uses. Install shelving to the perfect height above and around other functional elements, such as mobile storage, desktops, and cabinetry. Match the height of a work surface to the ergonomic needs of an employee at a standing or vertical desk. Use E-Z Shelving components as a framework for a complete, custom, office workstation system. The front of E-Z’s uprights presents a “tube” with a continuous vertical slot. The back edge of the shelving bracket is placed into this slot. Fastening a clamp assembly around the upright and bracket fixes the bracket at the desired height. Bolting an E-Z shelf on two brackets completes a fully-adjustable shelving system. To adjust the height, simply adjust the shelving brackets as needed.